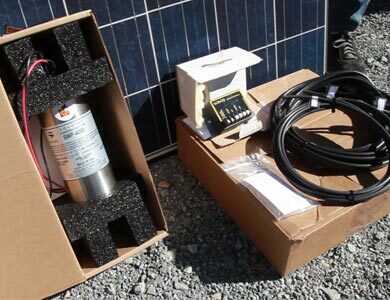 The S-Smart and D-Smart Solar Water Pump Kit will take water from wells, ponds, springs, creeks, cisterns and deliver water to tanks, agriculture tanks, pressure tanks, open irrigation or directly to drip irrigation. 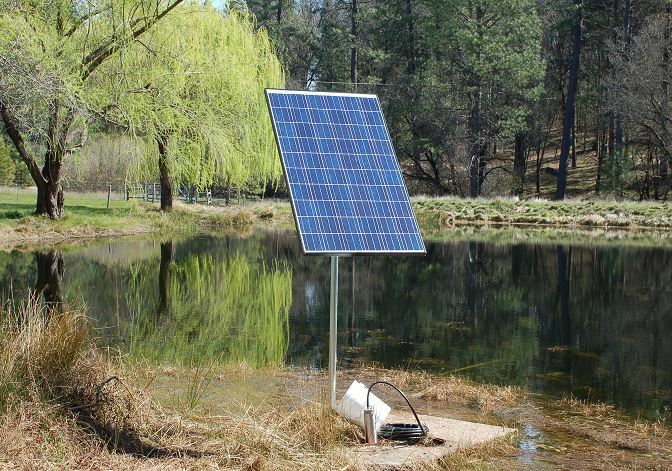 These Solar Powered Submersible Water Pumps are highly efficient, positive displacement pump, designed to be powered directly with a solar panel. Traditional water pumps are inefficient and costly to run because they pump a large amount of water in a short amount of time. 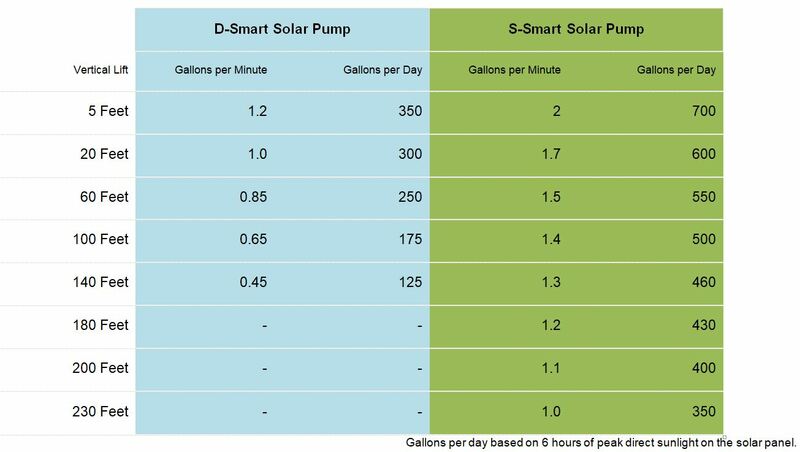 The S-Smart and D-Smart Solar water pumps will pump without costly utility bills, slowly and efficiently all day long! 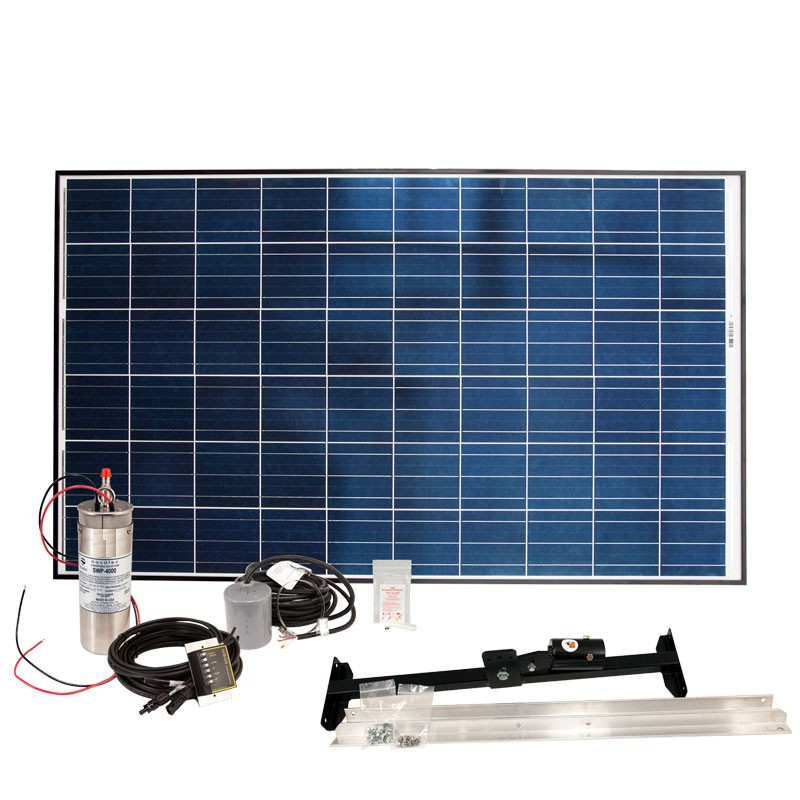 Easy Installation Our Solar Pumping Kits are easy to install, especially if you are handy doing standard home or auto repairs, with common tools on hand. In most cases it can be installed in a few hours. You will enjoy years of FREE FLOWING cool water, powered by UTILITY FREE SOLAR POWER! Low Maintenance Just wash of the solar panel with plain water 2-4 times each year or as needed. It is recommended that the pump be inspected and clean or repair any worn parts as needed (All replacement parts are available upon request.) Check pump and wires for a good clean connection. 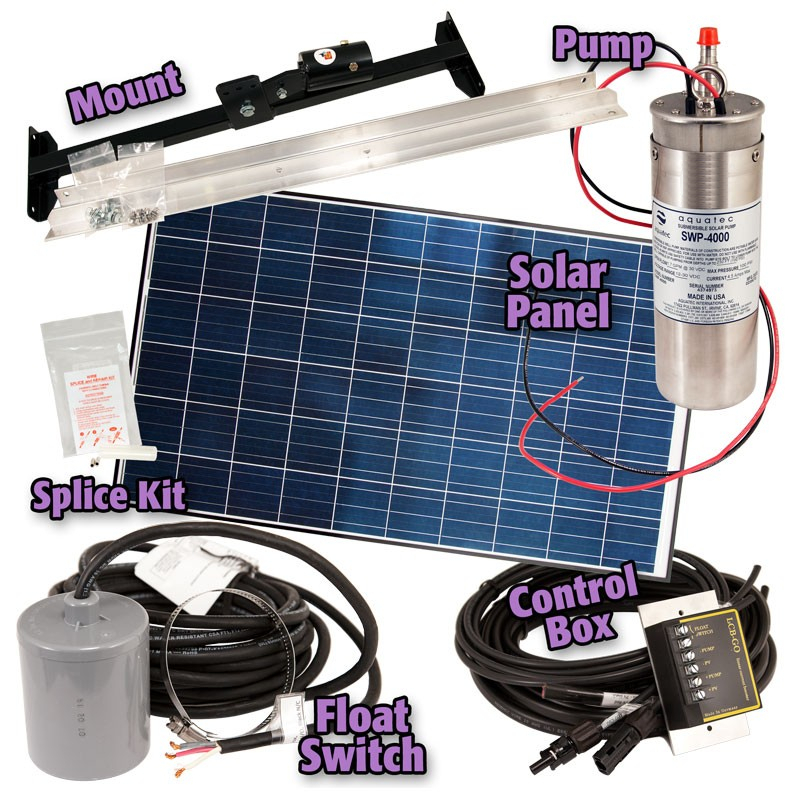 FACTS about this Solar Powered Water Pump Kit: The pump is operated directly by solar panels, (or by using a battery for day and night operation). This pump can lift water up to 230 ft, and can pump at a rate of nearly 2 gallons per minute (gpm), all day long. The pump measures only 3.75″ diameter x 12″ long. This pump comes with a one year warranty and a 25 year warranty on the solar panel. Depending on the amount of sunlight and vertical lift, our pumps can deliver up to 700 gallons per day… everyday! The S-Smart and D-Smart Solar Water Pump is ideal for remote off the grid locations for home and livestock water needs. The S-Smart and D-Smart Solar Water pump is an electric positive displacement diaphragm pump. Internal over pressure protection is included in the design of the pump to protect all components in the installation. The maximum pump diameter is 3.75 inches, designed to fit into a standard 4 inch plastic well casing. See the chart above for the performance of the D-Smart and the S-Smart pump. Choose the pump kit that best fits your gardening and watering needs.  Assembled in USA with proven design and quality.  Fits in any well casing 4” or larger.  Capable of pumping water from depths of up to 230 ft.
 Able to operate directly with solar power.  Rugged construction for optimum durability and corrosion resistance.  Anti Wicking cable entrance protects the motor from an incorrectly installed splice.  Over-sized eyelet for easy installation of safety line.  Built-in 50 mesh stainless steel screen to prevent debris intrusion.  Field serviceable with our full line of repair kits.  Warranty is 12 months from date of purchase not to exceed 12 months from date of manufacture. Extended Warranties are available. Click here to to watch videos of our projects.